f you're a fan of knitting, books, cats and cake (or any combination of them), then we're going to get along. I'm Lula. 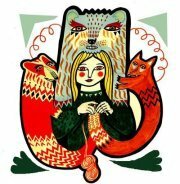 I'm an Yorkshire-based indie dyer inspired by whimsy, wonder and fantasy. And unicorns. Lots of unicorns. I love to find cosy moments in a good book, knitting project or playing with my cats Arthur and Jiji. You can also sometimes find me with a crochet hook, baking or roaming around outdoors.